Why is the McKinsey PEI so important for the overall evaluation of a candidate? Alongside doing a lot of data analytics especially in the more junior ranks of the consulting firms, there is still a high level of intense relations with the client organization starting with day one as a consultant. After all, consulting is a people business, thus McKinsey is putting a lot of weight on recruiting the “right” candidates with appropriate soft skills as well during the McKinsey PEI. Due to the importance and impact of McKinsey projects, there is an inherently high potential for conflicts within client organizations. More often than not, the context for working below the C-level execs hierarchy is not that desirable and less than ideal – and as a future McKinsey consultant you are mainly left alone with all this as part of your everyday job: Continue reading Why is the McKinsey PEI so important for the overall evaluation of a candidate? Why do so many candidates fail in the McKinsey PEI? McKinsey does not release a lot of information concerning the McKinsey Personal Experience Interview (PEI). Even during your McKinsey coaching session – which occurs in many geographical areeas before your on-site interviews – your McKinsey contact keeps information vague in respect to the PEI, having the discussion much more focused on the case interview part, the general procedure of the recruiting day and any other questions you might have about McKinsey. Virtually all candidates underestimate this part of their McKinsey interviews. At least you have the opportunity to influence one of those two aspects – which is obviously the second one. So let’s better understand the underlying reasons why virtually all candidates underestimate the PEI in their McKinsey interview prep: Continue reading Why do so many candidates fail in the McKinsey PEI? Hardly any questions asked during my McKinsey PEI – was it a bad example? Short answer first: Probably that was not a bad sign – most likely even it was a good sign that your interviewer did not ask many questions during your McKinsey PEI. More detailed answer Continue reading Hardly any questions asked during my McKinsey PEI – was it a bad example? Which Leadership example can I use without a formal leadership position? When it comes to the Leadership dimension in your Personal Experience Interview, there is a fundamental misunderstanding of many candidates. There is no requirement at all for your McKinsey Leadership PEI to be / have been in a formular Leadership position. This might now come as a suprise: Ideally, you don’t even have a formal leadership role in your PEI example (e.g. business unit director, department head, project lead), but initially you are acting in a group of equals. Continue reading Which Leadership example can I use without a formal leadership position? How many persons should I convince in my Personal Impact McKinsey PEI example? There is no clear rule or statement from McKinsey’s perspective, whether your example should focus on only one or several persons. However, I recommend very clearly to focus your McKinsey PEI example on convincing one specific person, as opposed to several persons at once (e.g. “In this situation, I needed to convince all customer stakeholders in the project”) or organizational bodies (e.g. “In this situation, I needed to convince the board of directors of this approach”). The main reasons for this recommendation are: Continue reading How many persons should I convince in my Personal Impact McKinsey PEI example? Are there any general CV-related questions apart from the McKinsey PEI? Actually yes – McKinsey interviewers also ask general CV-related questions during your interviews. This usually happens after an initial ice-breaking/warm-up, and before your Personal Experience Interview starts. As opposed to interviews in most companies outside the consulting space and also some other consulting firms, the focus and underlying idea of those general CV-related questions is slightly different in your McKinsey interviews. Continue reading Are there any general CV-related questions apart from the McKinsey PEI? How recent should my McKinsey PEI examples be? There is no clear cut-off period of how recent your McKinsey PEI examples should be. As a rule of thumb, the more current your example is, the better. Why? Continue reading How recent should my McKinsey PEI examples be? For structuring your 12-15 minutes PEI, I always recommend the PARADE framework. As a rule of thumb, the total PEI time is split up as follows: Continue reading How long does the McKinsey PEI (Personal Experience Interview) take? Can I use the same PEI example in different McKinsey Personal Experience Interviews? Or can use them at least in different interview rounds? Or can use them at least in different interview rounds? In total there are only 3 different Personal Experience Interview dimensions (Leadership, Personal Impact, Entrepreneurial Drive), but more than 3 interviews to reach your desired McKinsey offer. In addition, preparing your PEI examples in a way that they live up to the high performance standards of McKinsey is hard work and takes a significant amount of time. 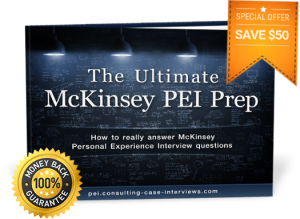 Continue reading Can I use the same PEI example in different McKinsey Personal Experience Interviews?